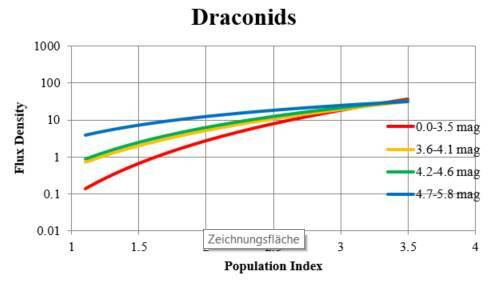 On October 8-9 night, European observers noticed a high increase of activity of the Draconids meteor shower, with ZHR probably ranging to more than 100 during the 22h-00h UT period. 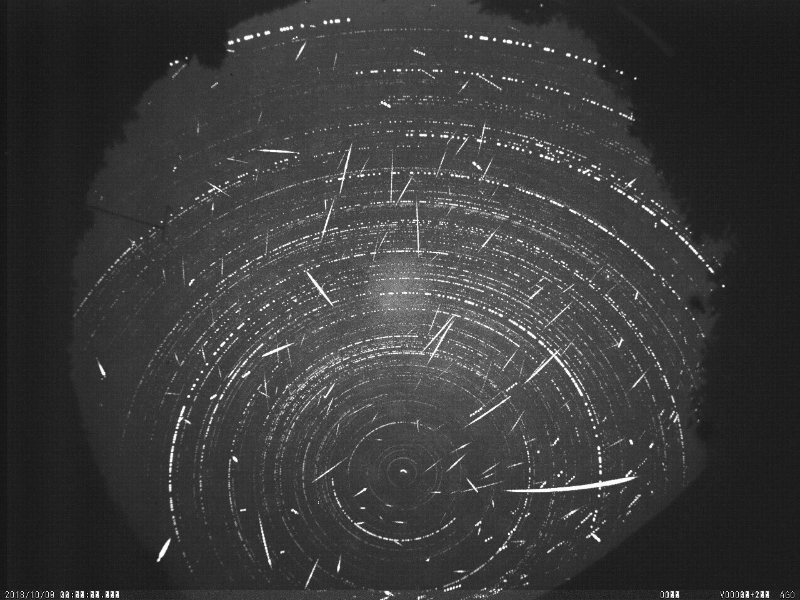 Meteor were mostly faint (+4 to +5 magnitudes), with few bright meteors. 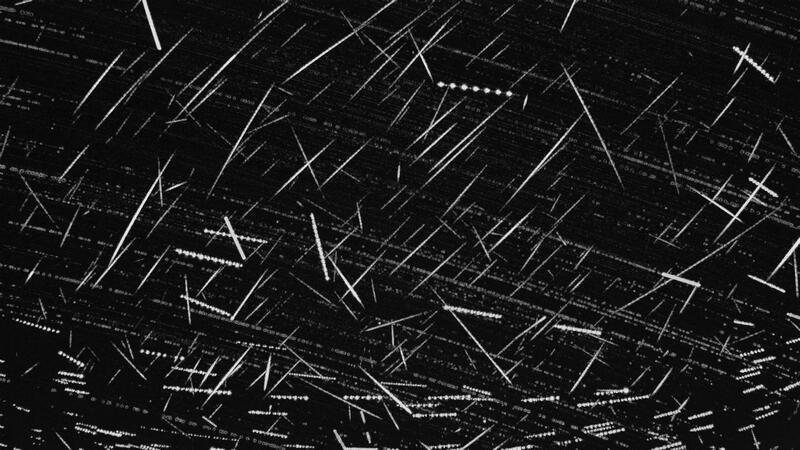 According to Sirko Molau, “many meteor had the typical appearance of fragile meteoroids to disintegrate slowly at the end of their trail“. 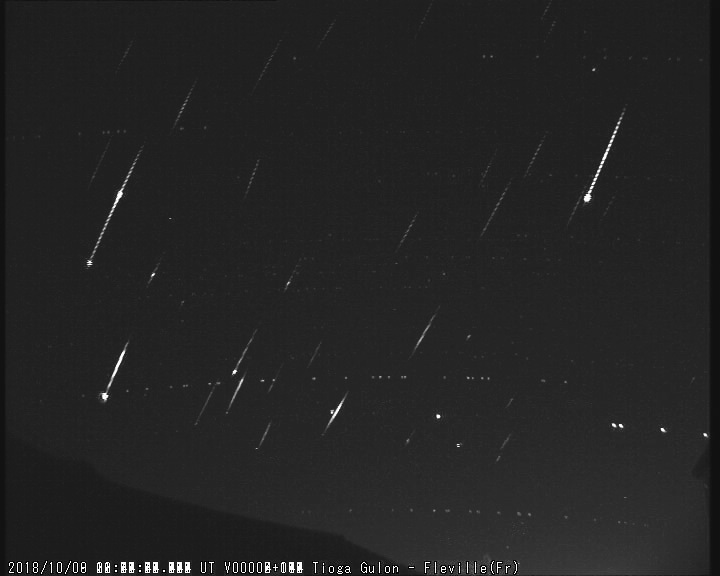 Tioga Gulon, who observed from Eastern France, could “observe an increase of activity between 22h and 22h30 UT, with 1 to 2 meteors per minute“. From Poland, Mariusz Wiśniewski also observed “an outbreak of draconids activity last night! The stream at maximum probably exceeded 100 meteors/h.” According to veteran observer Jure Atanackov: “Big #Draconid outburst! Observed 22:40-00:44 UT under mediocre conditions, LM about 6.5 and variable cloud cover (0-40%). Peak seemed to be around 23:00-23:20 UT. Rates were probably >100/h, even with the radiant below 30 degrees. Will be surprised if peak ZHR is not around several hundred. Possible secondary peak around 00:00 UT.” Other testimonies from meteor observers are available on dedicated MeteorNews page. 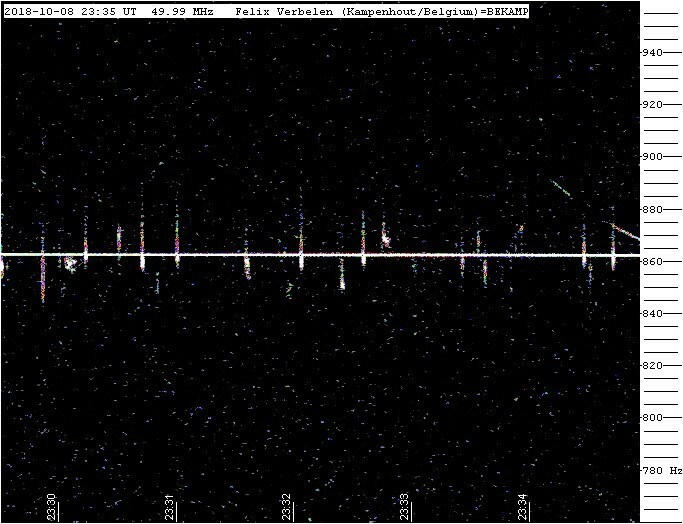 First analysis of radiant position performed by Carl Johannink using 1,200 orbits (of which ~720 were Draconids) recorded by CAMS BeNeLux network show the following results. 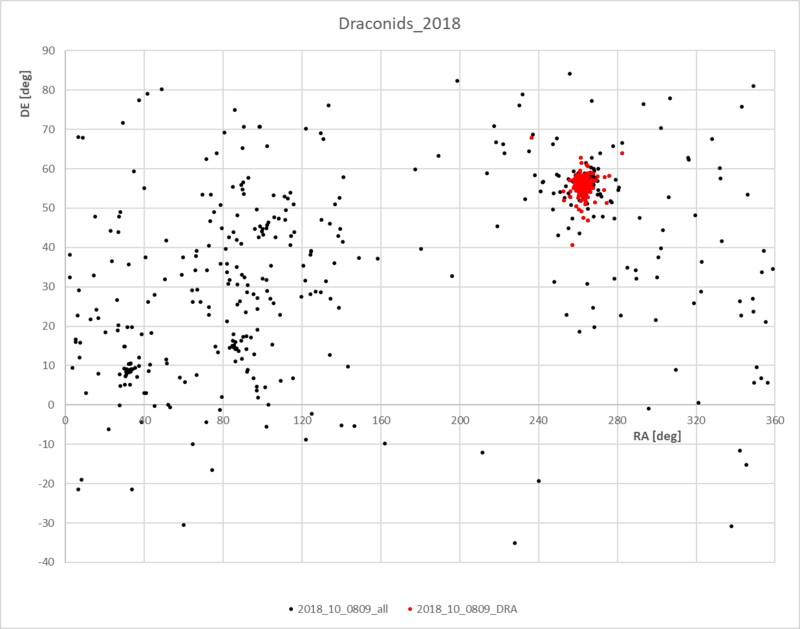 I would like to present first analysis results from video observations of the 2018 outburst of the Draconids. They are based on over 2,500 shower members, recorded by 37 video cameras of the IMO network in 270 hours of effective observing time in the night of October 8/9, 2018. The data set has a good quality: some cameras had to fight with cirrus clouds or fog, but in the absence of the moon the conditions did not change so much and many cameras could cover the full outburst. The flux density profile shows not a single peak, but two or maybe even three maxima. The primary peak occurred at 23:45 UT (SL 195.386°) with a flux density of about 55 meteoroids per 1,000 km^2 and hour. 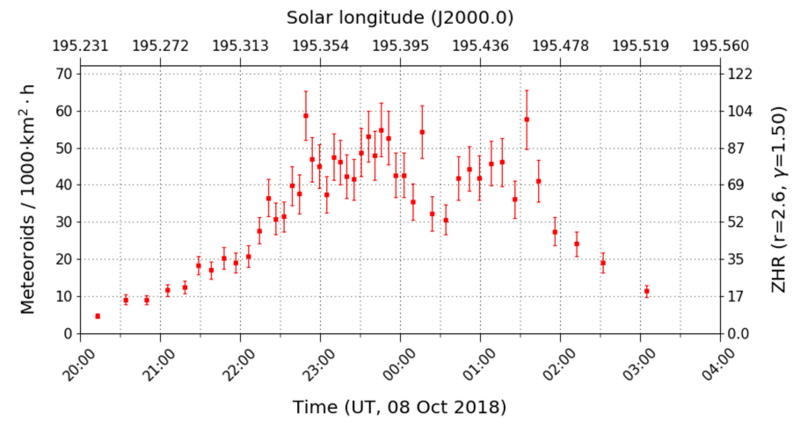 After a dip at 0:35 UT (SL 195.419°) we find a secondary peak at 01:10 UT (SL 195.444°) with up to 45 meteoroids per 1,000 km^2 and hour. The current profile hints also on a possible third maximum with the same strength as the main peak at 22:45 UT (SL 195.345°). 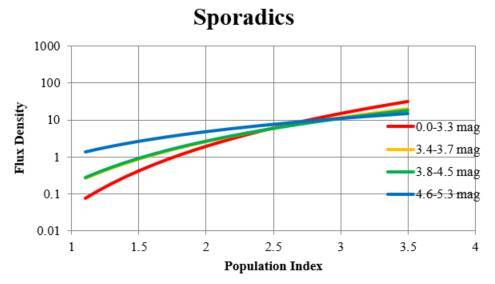 With a “default” population index of 2.6, the flux density translates into a peak ZHR of about 100. 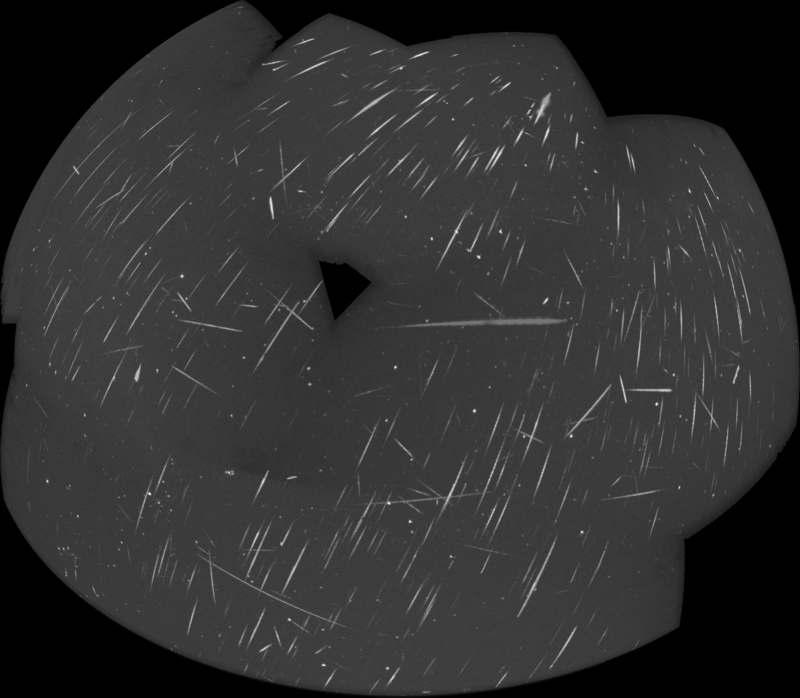 The Draconid outburst was particularly rich in faint meteors. 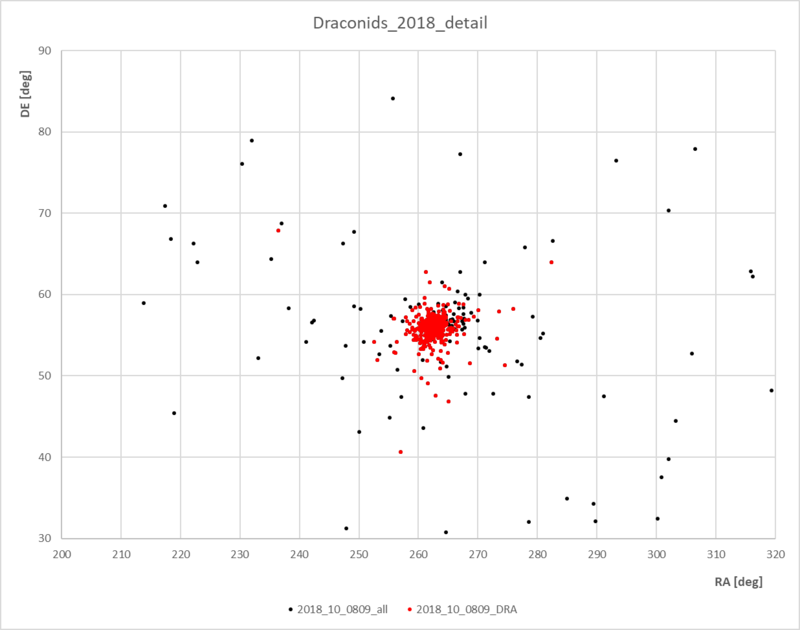 From the preliminary video data set, we obtained a population index of r=3.4 for the Draconids (which would be the largest r-value ever measured), compared to r=2.7 for sporadic meteors. Overall the outburst was quite different to 2011: It reached only about half of the peak flux density, but lasted more that three times as long and presented a complex profile with two or possibly even more peaks. Post updated on October 10, 2018, 20h 55min UT. 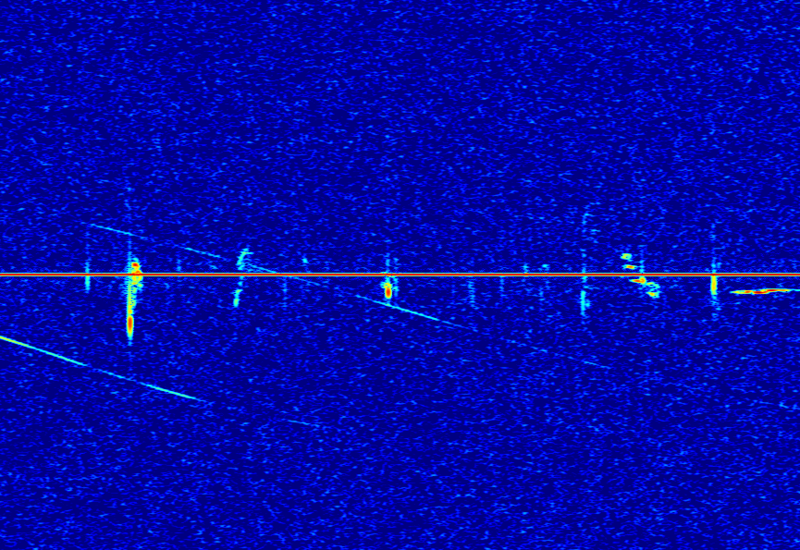 Got some good results from the graves radar on 143.050 MHz from sw Scotland. Very distinct peak in the RMOB data. Increase in forward scatter noted here in Drogheda, Ireland, on 143.049 around 23.00 UT. Would you reckon the reported UFO over Ireland’s west coast (November 9 at 6:47 AM local time) could have been a meteor?